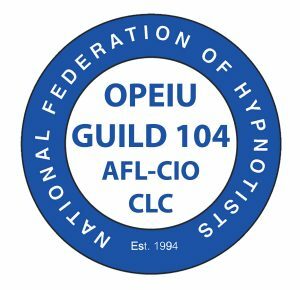 Our former Union affiliation (the National Federation of Hypnotists, OPEIU, AFL/CIO, CLC) which has been part of the International union for almost a quarter of a century, is honoured to be part of a new membership concept, with a new name, and less expensive to Canadian Members. Since we meet different criteria of needs from the OPEIU, we're now classified as a “Guild” as we don’t require contract negotiations & strike benefits, etc. since our members are for the most part self-employed, but sometimes need assistance in legislative threats to the practice of our profession of Consulting Hypnotist. For example, in Ontario, when the government was in committee for the proposed new Psychotherapy College, NGH approached OPEIU, who retained a lobbyist to speak for us in committee. That lobbyist was successful in receiving an undertaking from the government not to regulate the motivational and coaching hypnosis profession. We still have many of the benefits for our Guild Members and their families, like discounts on services and products, accredited university degree courses, etc., plus the strength of the International Union which has helped us so many times in the past, but now at a more reasonable cost. $96 for an annual 12-month membership. in ontario in the past?